Last month we had to put up a bigger mailbox to hold all the mail coming into our household. My mother and I love our catalogs – admitted shopping addicts – but the whole thing has gotten out of control. One day my mother counted 28 catalogs in her portion of the mail alone; and then there’s the plain junk mail that comes in envelopes. With my bad back, there are times when I cannot even go get the mail on my own. There are special offers for everything, charities to support, sweepstakes to be won, and money to be borrowed. The lonely side of our selves actually takes the time to open, read and consider each thing. My mother is quicker than me though – I have a lot of piles everywhere around the house that are dealt with in marathon sessions, especially when the cleaning lady threatens to quit on me once a week. Weekly reading is something I handle better than daily, however. Which means that while we subscribe to both the Latrobe Bulletin and Tribune-Review (because I still believe that reading news is better than watching television), I often don’t actually get around to reading the papers until the weekend. Mom lets me know who has died though, in case we need to attend a funeral. Come Sunday I am faced with a monster pile of scattered paper: newsprint, junk mail, catalogs, magazines, cardboard boxes, and various other printed material. That’s when I start to consider the immense waste that is printed communication. We are information junkies, constantly in need of something new to feed our attentions. But the price for that comes from our natural resources – trees and other plant material used to make paper, not to mention everything that goes into the actual process of printing and distributing. I love the feel of books, magazines and newspapers in my hands: but I just can’t make the switch to all-digital except for the short blurb format of websites like Huffington Post, Facebook, etc. I also value my printed material, some more than others. If I bought it, then I try to get the most from it that I can. If it’s junk mail, I would like to see it provide some useful purpose rather than going directly into the trash. One reason I do not direct-mail the Laurel Mountain Post is because of the waste factor – I print copies knowing that people will pick them up and read them, not just throw them out with the garbage and the daily paper. I also encourage my readers to recycle them in collection bins rather than toss them. Which brings me to my own piles of paper trash. In the Summer 2013 issue of the Laurel Mountain Post, pages 20-21, my “Down on the Farm” column discussed the small joys of composting, and its big payoff. My strategy for tackling the paper problem is to start recycling it in various ways. A heavy-duty paper shredder is my favorite toy. 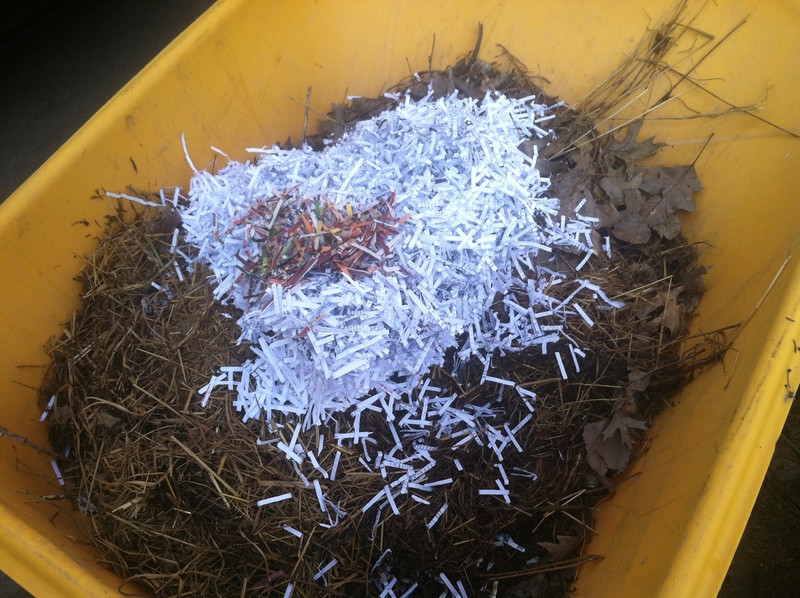 All my junk mail, especially the kind with personal information, goes through the shredder. Then it goes onto our compost pile as part of the decomposition recipe which yields nutrient-rich dirt for next year’s garden. Yesterday we worked on mulching some planting beds in preparation for annuals. 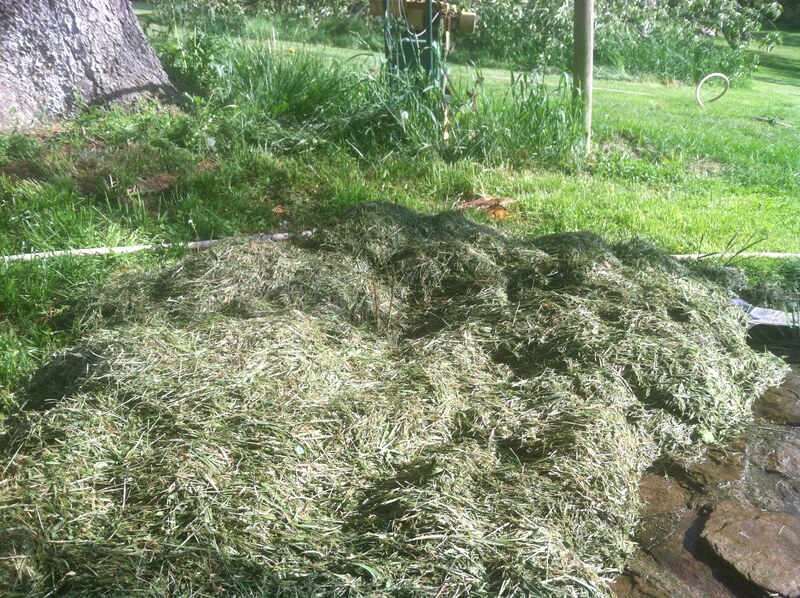 After mowing down the grass along our stone wall, we then covered the intended bed with layers of wet newspaper. The next step was to collect grass clippings from our lawn, then spread in a deep layer over the newspaper, watering it down again. In a few days, it will brown up and look like regular mulch, but we will top dress it with cypress mulch for a prettier finish. Next year, these thick beds will have composted down into richer soil, resulting in a no-till and pesticide-free garden bed. Then we’ll repeat the entire mulching and top-dressing process annually. 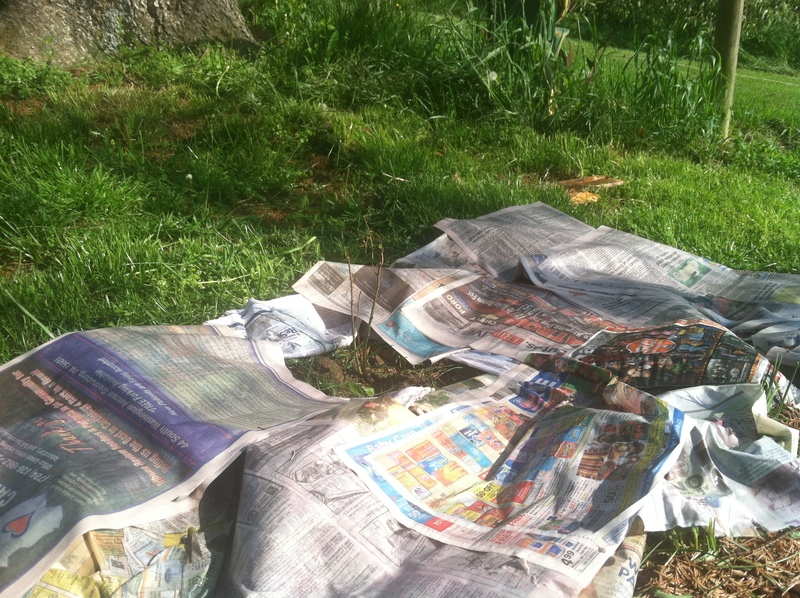 Magazines are best left to the collection bins (or donated for arts & crafts), not the garden. Glossy pages and their ink types are not good things to add into the environment. I still have to figure out a system for collecting and storing my paper trash until it’s time to recycle. I couldn’t bear it if the cleaning lady quit – rescue teams might have to be called in to dig me out from under it all. By Cathi Gerhard in Down on the Farm, Feature Stories on May 17, 2013 . Thanks so much for sharing about your ‘junk-mail’ and your gardening, too. – I always enjoy hearing from you! What about the ink? does that decompose, and isn’t it made of chemicals? “Newspaper is safe to compost, but it breaks down quite slowly because of its high lignin content. (Lignin is a substance found in the woody cell walls of plants, and it is highly resistant to decomposition).